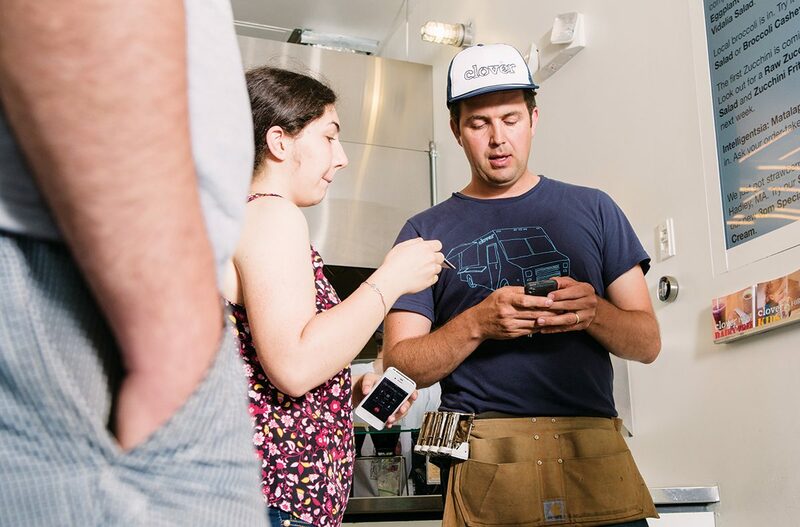 Armed with a chickpea fritter and mountains of data, Ayr Muir, of Cambridge’s Clover Food Lab, is just a few thousand restaurants short of saving the world. By Janelle Nanos·	 7/28/2014, 2:30 p.m.
Ayr Muir is hungry, and in a hurry. 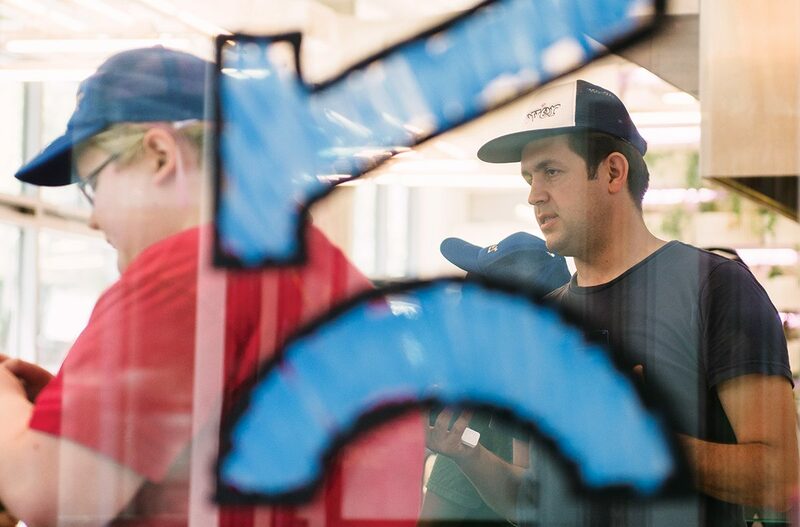 It’s barely noon on an overcast June day in Washington, DC, and as he ducks into Chipotle’s new concept chain, ShopHouse Southeast Asian Kitchen, Muir whips out his iPhone and starts its stopwatch. The seconds tick by as he counts the heads of the customers ahead of him in line: 17. When he picks up his rice bowl from the counter, he stops the timer—nine minutes, 30 seconds—then does some quick math out loud. 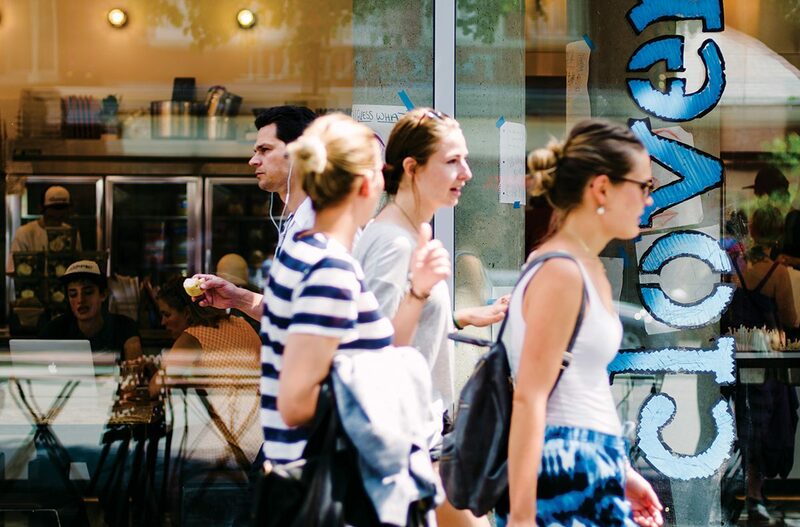 ShopHouse is serving two customers per minute, he says, and their average meal ticket is $11—so Muir figures they’re taking in around $1,000 per hour. A satisfied look settles on his boyish face: He’s winning. 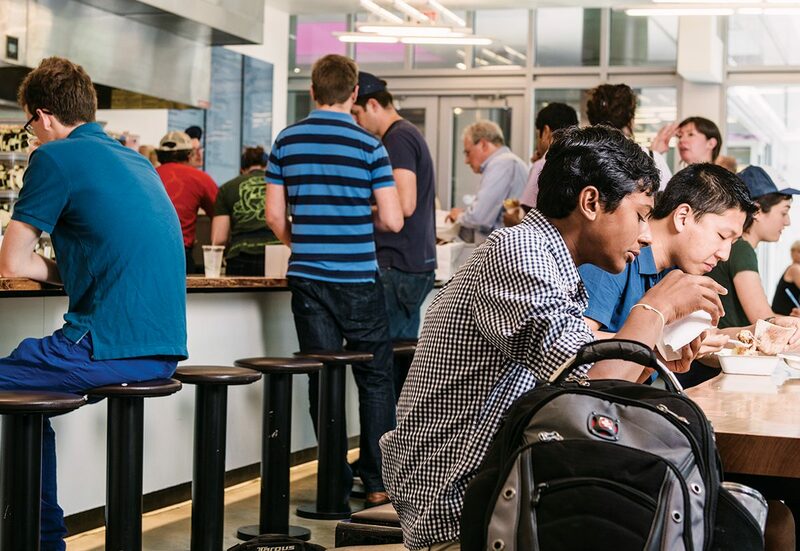 Muir knows that Clover Food Lab—his quick-growing, data-driven, Cambridge-based fast-food startup—can process six customers per minute, three times as many as this place. And he’s just getting going. Over the course of the day, stopwatch in hand, Muir will consume a taco from a truck, four bites of a salad at Chop’t, a bowl of ramen noodles, at least three pour-over coffees, a slice of dessert pizza, a half-dozen plates of Asian tapas, a gin cocktail, and several glasses of rare wine at Doi Moi. All the while he’s closing deals, scouting locations, and—most important—measuring himself against the competition. 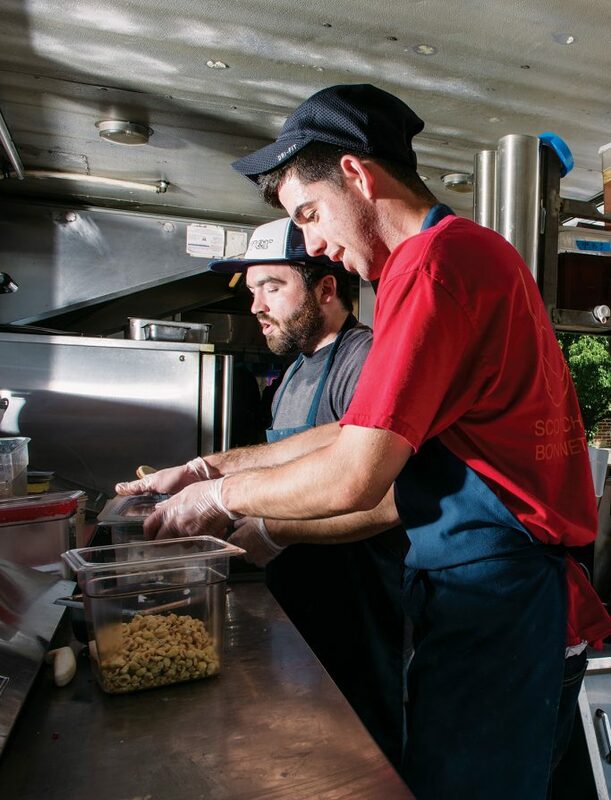 He has been doing this for years, since before he launched Clover’s first food truck back in 2008. 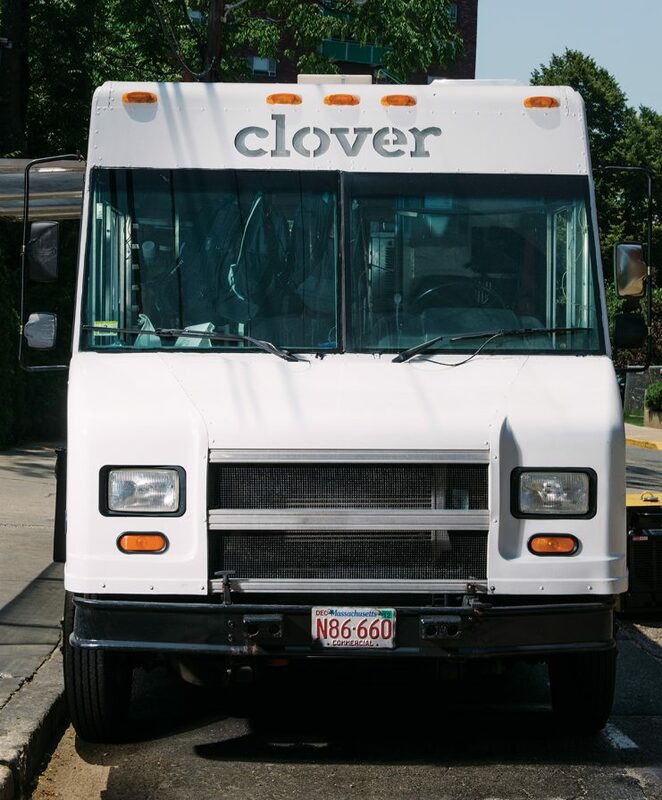 Clover is up to six trucks now, plus five brick-and-mortar restaurant locations. A sixth restaurant will soon open in Central Square, and the first of several DC locations is scheduled to debut in the fall. A new partnership with Whole Foods rolls out this month, in which “Clover to Share” coolers will be installed in six supermarkets across Massachusetts. 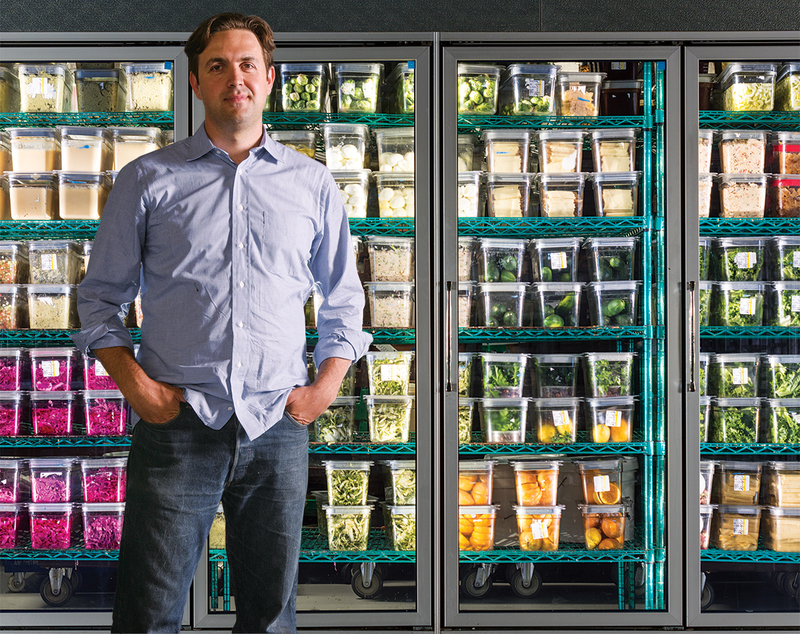 Muir envisions an asymmetrical nationwide chain, in which you can get Clover’s fresh, local, and seasonal food at a truck, a restaurant, a supermarket, or a kiosk. Armed with an extraordinary business plan and a cryptic motto—“Everything Will Be Different Tomorrow”—Clover has been growing at a feverish pace. When he opened his first restaurant, Muir scrawled a manifesto on the wall in black paint: “This is a prototype,” he wrote in bold letters. “We will screw something up. We’ll screw many things up. Tell us when that happens.” This philosophy is all part of an elaborate feedback loop that Muir has designed to engage his patrons with his staff, and with one another. Sometimes, customers complain that there’s no salt on the tables. That’s by design—partly because Muir doesn’t think it’s healthy, and also because, if enough customers ask for salt, it’s a sign that his recipe needs tweaking. “I like the friction of it,” he explains. That’s a good analogy, except for one thing: Ayr’s ambitions are much, much bigger. 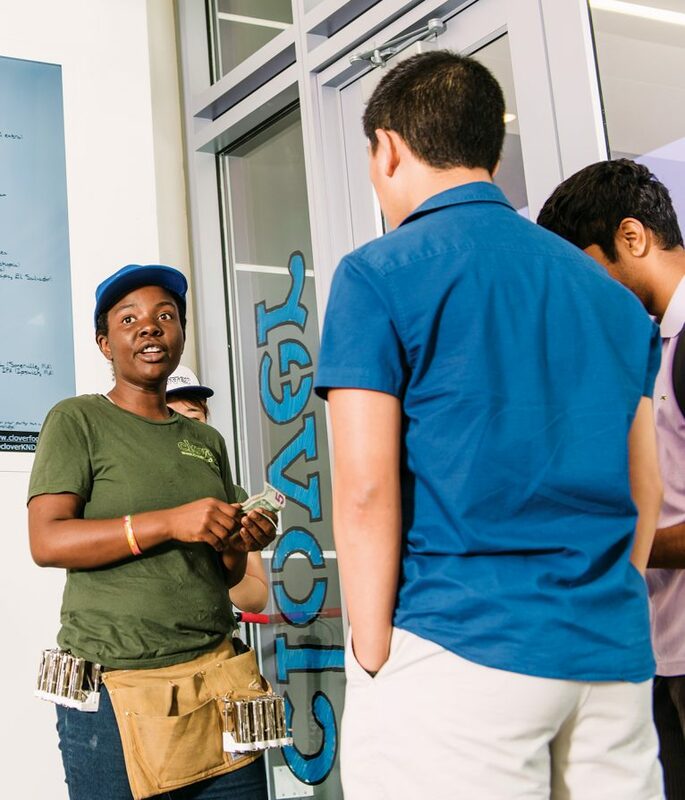 Muir, an MIT-trained engineer, doesn’t just want to make a ton of money in the fast-food business, or even just create a lifestyle brand. To him, Clover is a grand experiment in changing humanity’s most destructive habits—and, just maybe, a way of saving the planet. Muir is tall, and has a calm, thoughtful demeanor. He doesn’t engage in the startup-speak prone to entrepreneurs, though he does have some of their trappings: He drives a Mini Cooper, carries a Filson bag, does yoga three or four times a week, and rides a BMW motorcycle. He can seem a bit aloof at times, and in some ways, so can Clover Food Lab. The aesthetic is laboratory chic: sleek verging on sterile. The design of both the trucks and the restaurants, by the local architecture firm Single Speed Design, allows natural light to filter in, with massive windows built into the trucks and floor-to-ceiling glass in the restaurants, like an Apple Store. All-white walls are decorated with crayon sketches patrons have made on the reams of butcher-block paper used as place mats. Flat-screen monitors display the real-time availability of each menu item in a font based on Muir’s handwriting. On a busy Tuesday morning this spring, Muir stands on a wooden bench in the center of his Harvard Square restaurant—his first brick-and-mortar eatery and the site of Clover “world headquarters,” according to the sign on his office door. 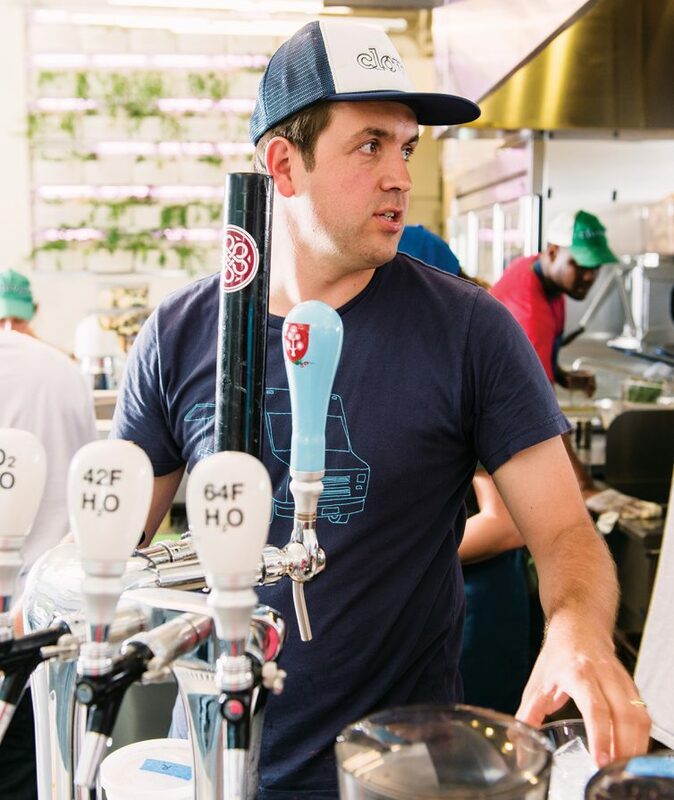 He’s in a T-shirt, jeans, and white Converse high-tops, and his light brown hair flops forward like a skater boy’s as he snaps photographs of a “Clover to Share” cooler, a test run for the company’s takeout partnership with Whole Foods. Around him, customers filter in; some of them look disoriented. 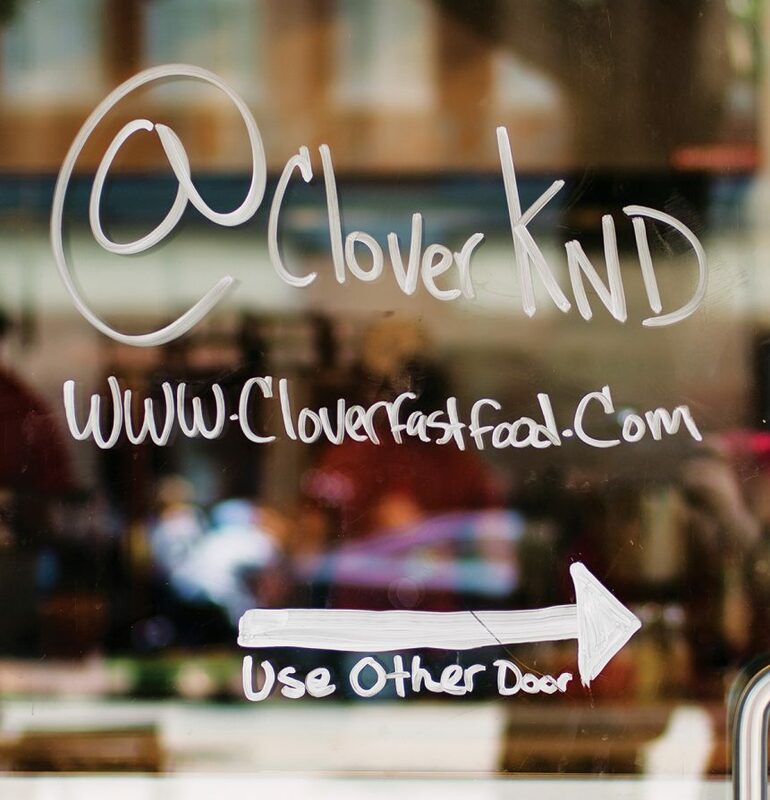 At Clover, there are no cash registers, no photos of menu items, and no queue to speak of. 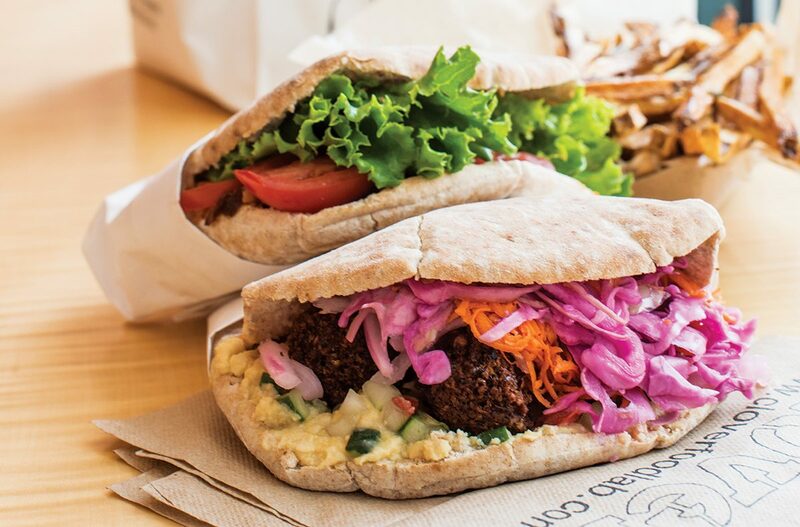 When you’re ready to order your chickpea fritter sandwich, leek-and-cheddar-stuffed popover, or cinnamon-spiked lemonade, you just walk up to the order taker, Azeb Zegeye, a young woman in a Clover trucker’s hat, standing in the center of the room. With each encounter, Zegeye engages in Clover’s routine call and response: “Have you eaten here before? Well, welcome back. 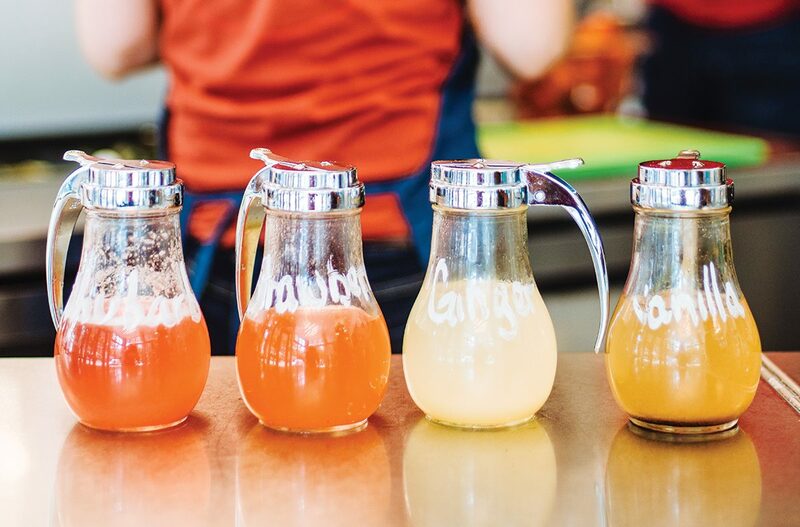 Have you tried our lemonade? Here, have a sample.” Her patter doesn’t sound scripted, but it’s designed to aggregate specific information for later analysis. She enters all answers into an iPod Touch app built by Muir—another way of monitoring and studying his customers’ habits. You can watch your sandwiches being prepared behind a low silver counter. The kitchen staffers wrap them in paper, in keeping with Muir’s commitment to a zero-waste, all-compost restaurant. And when you’re handed your food—there are no trays—you can eat at one of the restaurant’s long, communal wooden tables. One thing you’ll never hear Zegeye say is the word “vegetarian.” Clover doesn’t serve meat, yet Muir’s 200 employees are specifically instructed not to use the V-word, and have been hired, in part, on the basis of their appearance: They can’t fit the “wimpy, meek, weak associations people have” with vegetarians, Muir says. It’s the central paradox of Muir’s vision: The transformative power of Clover lies in its menu being entirely meat-free—yet Muir believes the success of the chain hinges on keeping that distinction very, very quiet. 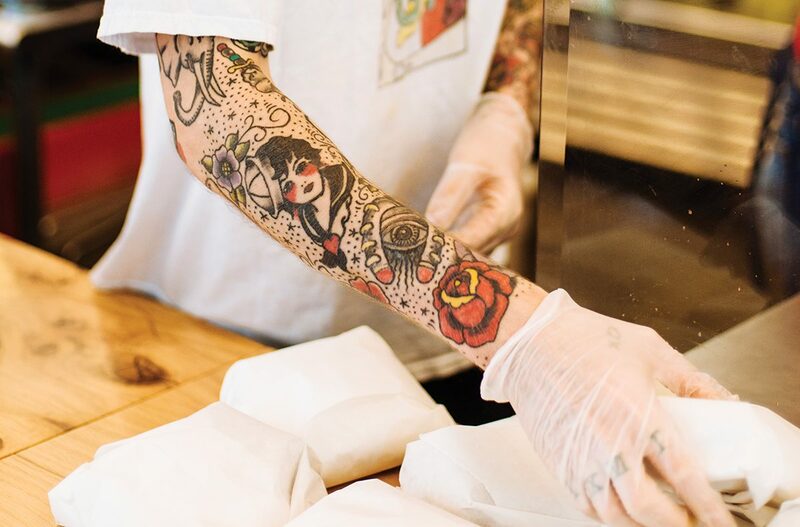 His favorite stat is that only 10 percent of Clover’s customers identify themselves as vegetarians.